Tales of a novice driver: Left turns. I avoided a collision! Left turns. I avoided a collision! My daily commute includes many left turns, they are tricky because the European traffic law basically says that when turning left I should give way to traffic approaching from all directions except from my left, and at intersections of roads of the same category, I must also give way to trams approaching from the left. Luckily I do not usually drive on roads with tram traffic, but I do have quite many challenges. Winter and dark conditions adds difficulties to the already tricky left turn, e.g. a pile of snow can often be blocking my view from the road, and dark conditions impair visibility as well. Crossing a very busy road when turning left can be a test of patience but often I get considerate drivers yielding to me, which is a very nice thing. A couple of days ago, a car nearly crashed into my car when turning left, the car was coming from the opposite direction but I was already in the intersection when this happened and although I was driving very slowly it would have been difficult to stop, I should have used the horn though because I could see the driver looking in all directions except in front of her, and it was like a movie in slow motion, thinking what to do, I just continued turning and the driver from the other car stopped on time and I crossed safely. phew! 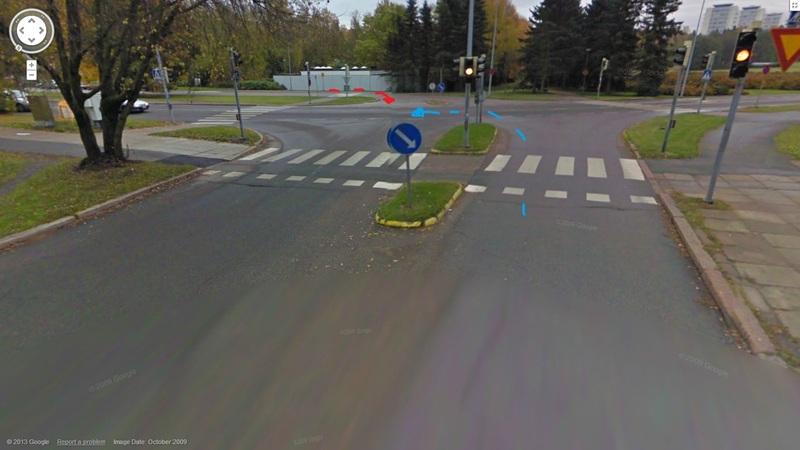 I've searched some info about left turns in Google and I've found this article, it is from the USA though, but I am wondering if the following is true in Europe. It looks like common sense to me, in my near collision incident I started turning first because there wasn't any car in the opposite direction when I started turning, but it came suddenly. See the picture below, taken from Google maps. 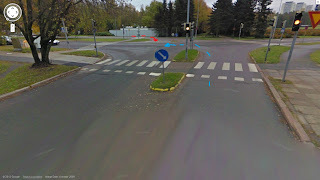 I added a blue arrow to show where I was going, and the red one is the other car. I do have the feeling however that should a collision have taken place I would have been the one to blame. Here in the U.S., I see that happens a lot, even when you just walking. You think that you're in the clear, but all of sudden a car seem to come out of nowhere. Driving is such a big responsibility and you just have to be extra cautious, especially when it come to living in a large city.